The WQRF Environmental Impact Study was created to address regulatory issues related to water softener discharge. The first phase of the study was undertaken to investigate the effect home ion exchange water softeners may have on the performance of on-site septic tanks. Softener discharge into septic tanks has been a point of contention for decades. In the 1970s, Water Quality Research Foundation (known then as the Water Quality Research Council) funded studies conducted at the University of Wisconsin-Madison and at NSF International that provided robust data to refute the allegations against softener discharge into on-site systems. The data did not find fault with water softeners discharging into septic systems. Being studies with real-world applications, however, they lacked the flexibility and control to change variables to reflect worst-case scenarios. Furthermore, the studies did not evaluate monovalent (+1 charged ions, such as sodium) to divalent (+2 charged ions, such as calcium and magnesium) cation ratios (M/D ratios), which have since been shown in large-scale industrial aerobicactivated sludge systems to cause poor settling of solids. The present study was designed to investigate the effect of varying M/D cation ratios both in controlled laboratory and real-world settings. 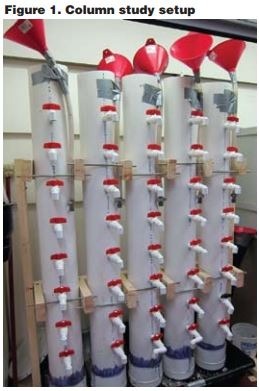 The laboratory study was set up with columns that contained solids collected from operating septic tanks to which wastewater was added with varying levels of sodium (as well as calcium and magnesium), modeling the periodic addition of regenerant from softeners operating at different salt settings, ranging from high efficiency (~4,000 gr/lb) to very poor efficiency (~1,000 gr/lb). To reinforce the column experiments, data was obtained from private septic tanks to determine the effluent quality from septic tanks which did or did not receive the regenerant from softeners. To allow for control and comparison of the input of various levels of cations, five identical columns were constructed to simulate five septic tanks in a laboratory setting operated in parallel (Figure 1). Septic tank solids (settled liquid sludge from the bottom) were pumped from a septic tank in Blacksburg, VA, placed in plastic containers and transported to the laboratory for use in each run. After waste distribution and salt amendments, the columns were allowed to settle for several days before testing commenced. The columns were operated in each run in a manner that simulated septictank use. Raw wastewater was then collected from the plant and used as influent for the columns. A volume of 3.8 liters of influent was added to the column each day to allow the columns to have a seven-day detention time. The influent received salt additions that were calculated based on the specific experimental scenario being modeled. To make room for the daily influent addition, 3.8 liters was also removed from the columns every day. A total of five runs were conducted over a one-year period. The column runs were initially operated for three weeks; subsequent runs were extended to eight weeks. Data from the first few runs indicated that more useful results were just starting to appear toward the end of the first three weeks. It was determined to be beneficial to extend the run time. On the final day of testing for each run, samples were collected and analyzed from the third, fifth, seventh and eighth ports (numbered to top of each column). This was done to determine if there were any differences with depth and also provided assurance that the salt additions were similar throughout the column. 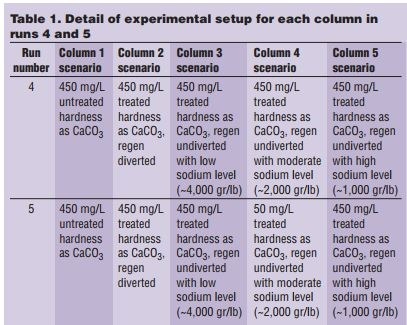 Each column was given a specific experimental scenario pertaining to hardness level treated and/or whether the water softener regenerant was diverted. The first three runs were carried out mostly to gain practical experience and to further develop the plan for the last two runs. Table 1 summarizes the experimental scenarios for runs 4 and 5. Testing for total solids (TS), total volatile solids (TVS), total suspended solids (TSS), volatile suspended solids (VSS) and five-day biochemical oxygen demand (BOD5) were carried out in accordance with Standard Methods for the Examination of Water and Wastewater—a joint publication of the American Public Health Association (APHA), the American Water Works Association (AWWA) and the Water Environment Federation (WEF). Analysis for protein and polysaccharide content took place once a week during the first few runs. Upon examination of the data from the first runs, it appeared these tests did not yield useful data and, therefore, were not analyzed in later runs. Case studies were also organized and samples were provided from New York and North Carolina. In North Carolina, on-site septic system industry professionals took WQRF Environmental Impact Study – Septic Systems: The Results Are In By Pauli Undesser, CWS-VI Figure 1. Column study setup Water Conditioning & Purification March 2013 samples from the ‘quiescent zone’ of septic tanks. These samples were then analyzed for COD, TS, TVS, TSS and VSS using the aforementioned methods. Samples were also analyzed to determine the concentrations of calcium, magnesium and sodium in the septic-tank discharge. These data were compared to other case study samples and the comparisons were related back to the column study data to see how well the lab study mimicked real-world data. The New York case study was carried out at an apartment complex in Naples, NY. There are two apartment buildings of the same size, each at maximum occupancy. Each building has its own septic tank, but both buildings are served by the same water softener. The regeneration waste from this softener can be diverted to either of the two septic tanks. The regeneration waste was sent to one tank while the other tank received only the effluent from one apartment building. Sampling procedures were communicated to the team managing the complex and regular samples from both tanks were sent to the Virginia Polytechnic Institute and State University (Virginia Tech) lab twice a month. These samples were then analyzed for the same parameters as the other case study samples. BOD5 analyses were carried out by a local laboratory in New York, certified for the analyses. The full results will not be included in this article because the report will not go public until WQA Aquatech USA. It can be stated, however, that the data indicate the use of efficiently operated water softeners (~4,000-gr/lb salt efficiency) improves septic tank performance, moderately operated softeners (~2,000-gr/lb salt efficiency) demonstrated equal or improved results, while the use of very inefficient softeners (~1,000-gr/lb salt efficiency) may have a negative effect on solids discharge to the drain field. Level of impact will depend on a) the level of hardness in the water, b) whether the regeneration waste is discharged to the septic tank and c) the amount of excess sodium present in regeneration wastes. A detailed report of findings will be presented at the WQA Aquatech USA show on Tuesday, April 2 at 10:30 a.m. Virginia Tech researcher, Dr. John Novak, will review the study setup and its findings, followed by perspectives from the National Onsite Wastewater Recycling Association, Inc. (NOWRA), the leading authority for on-site systems, and a representative from the regulatory realm. The presentation will close with a panel discussion to allow direct interaction with the speakers. This presentation and panel session will provide superior insight regarding how to use water softeners in conjunction with on-site wastewater systems with positive impacts on septictank performance. Pauli Undesser is Director of Regulatory and Technical Affairs at WQA. In addition, she holds the position of Toxicology Manager for the WQA Gold Seal Certification Program and previously was Product Certification Supervisor. Undesser holds an MS Degree in biochemistry from Northern Illinois University and a BS Degree in chemistry from the University of Illinois-Urbana/Champaign. She may be reached via email, pundesser@wqa.org or phone, (630) 929-2514. The Water Quality Research Foundation (WQRF) was formed in 1949 to serve, on behalf of the Water Quality Association (WQA), as a universally recognized, independent research organization. To gain more detailed information about research funded by WQRF and to access the executive summaries, full reports and other resources, visit WQA’s website at www.wqa.org. The Water Quality Association (WQA) is a not-for-profit, international trade association representing the residential, commercial and industrial water treatment industry. WQA maintains a close dialogue with other organizations representing different aspects of the water industry in order to best serve consumers, government officials and industry members. Contact WQA at www.wqa.org or (630) 505-0160.